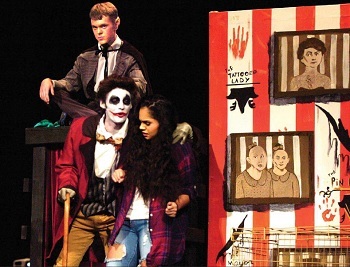 Above, Maniacal Max (Nolan Winters) welcomes Monique (Thalia Luna) to the Sideshow as Benny the Bat Boy (Lowell Irby) looks impassively on during Artesia High School Drama’s performance of “FREAK” Saturday at the AHS Auditorium. Below, Monique finds herself bound by the other inhabitants of the circus-esque purgatory as Max watches from above. The play carries compelling messages about the impacts of bullying among youth and the consequences of teen suicide, delivered powerfully by the young actors. 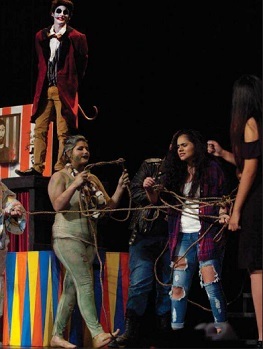 The group will present the play as its NMAA State High School One-Act Production Competition piece Oct. 25-28 at the University of New Mexico Theatre Arts Facilities in Albuquerque.